Fr. 831. 1918 $50 Federal Reserve Bank Note. St. Louis. PCGS Currency Extremely Fine 45.There are currently only 53 known examples of this elusive denomination which is only represented by the St. Louis district. PCGS Currency has graded 18 of these examples with all graded somewhere in the EF/AU range with a two notes making the Uncirculated grade at a 63 and 64. This particular example has been off the market since 2002 and is extremely attractive with excellent colors, centering and overall eye appeal. 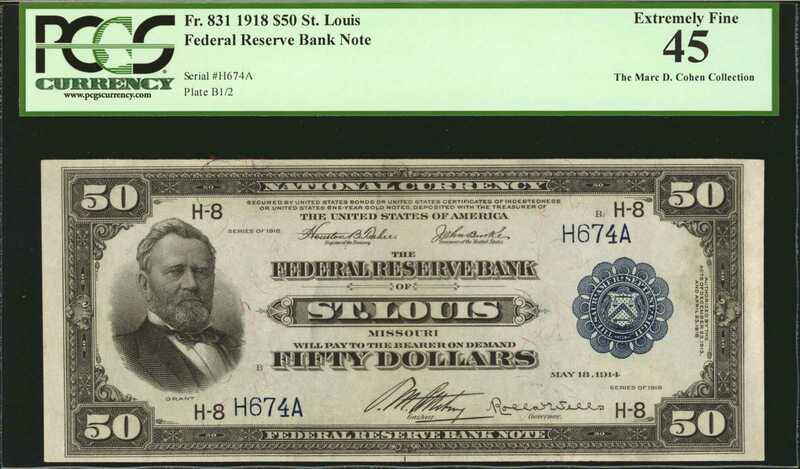 A type which would fit any high end currency collection.<p>$50 Federal Reserve Bank Note, Series of 1918<p><p>The $50 denomination of the Series of 1918, with the city and bank on the face, was issued just in one location, St. Louis, and in only one signature combination. This type is a classic rarity, with an original distribution of only 4,000 pieces. In addition to the St. Louis notes, plates were made for Atlanta and 40,000 notes were printed (but never issued), and for Boston, for which there is no record of any being printed. The back shows Panama in the form of a goddess standing between two oceans, with a passenger liner to the left and a battleship to the right. <p><p>Texas collector William A. Philpott, Jr., long-time secretary of the Texas Bankers Association, rescued most of the existing St. Louis notes by corresponding with Federal Reserve Banks and alerting employees to his interest. At one time he reported that Treasury records revealed just 33 outstanding, but he later amended that figure to 70. I (QDB) remember meeting and talking with Mr. Philpott in the 1950s. He was the grand master of Federal Reserve notes of different denominations and varieties at a time when few others were interested.From the Marc D. Cohen Collection.